Whether you’re working retrofit applications or new construction, NECC has the right two-position spring return actuator for the job — with the largest torque range in the industry. 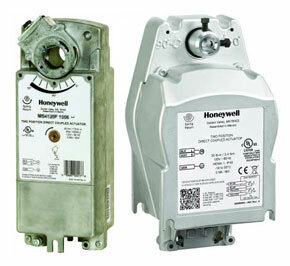 Along with meeting safety standards, Honeywell fire and smoke actuators also feature an energy-saving patented design that eliminates limit switches to reduce power consumption. 30 lb-in. (3.4 N•m) or 80 lb-in. (5.9 N•m) minimum driving torque at 350°F (176°C). Reversible mounting facilitates use in either clockwise (cw) or counterclockwise (ccw) spring rotation. Designed to operate reliably in smoke control systems requiring Underwriter’s Laboratories Inc. UL555S ratings up to 350°F. Models available with SPST position-indicating switches (7°, 85° stroke).